WASHINGTON, D.C. — U.S. Senator Frater Robert Byrd (Alpha-Pi, George Washington Univ.) of West Virginia, a fiery orator versed in the classics and a hard-charging power broker who steered billions of federal dollars to the state of his Depression-era upbringing, died Monday. He was 92. Byrd, a Democrat, was the longest-serving senator in history, holding his seat for more than 50 years. He was the Senate majority leader for six of those years and was third in the line of succession to the presidency, behind House Speaker Nancy Pelosi. 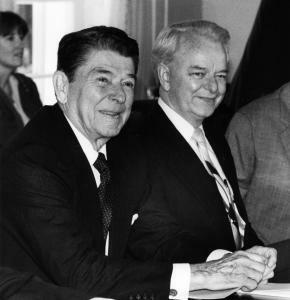 "It has been my greatest privilege to serve with Robert C. Byrd in the United States Senate. I looked up to him, I fought next to him, and I am deeply saddened that he is gone," fellow West Virginia Senator Jay Rockefeller said in a statement. "He leaves a void that simply can never be filled. But I am lifted by the knowledge of his deep and abiding faith in God, I have joy in the thought of him reunited with his dear [late wife] Erma." The Offices of the Grand Chapter extend our heartfelt condolences to the friends and family of Senator Robert Byrd.